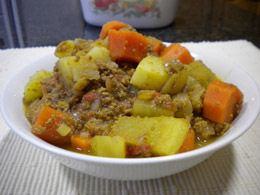 If you love curry, then you’ll love to try this beef curry recipe that is very mild so that children will love it too. You can choose to make it hotter or milder if you prefer by adding in more or less curry powder. I love the spiciness of curry, but am not a huge fan of having my mouth on fire and my children don’t like fiery foods either, so I always make my curries very mild. This is my mom’s beef curry recipe which she has made since I was a little girl and has always been a family favourite. It has traditionally been made with potatoes and carrots, but I like the addition of sweet potato as I think it enriches the flavour and adds some extra vitamins and minerals. Feel free to leave it out if you prefer only potatoes. You could use lean beef chunks for this recipe instead of ground beef if you prefer. We love to serve this tasty curry with rice and finely chopped tomato, desiccated coconut and fruit chutney or chilli sauce. ½T mild curry powder – you can use a bit more or less depending on how hot you like your curry. 1. Steam-fry the onions and garlic (see cook’s notes) till soft, and then add the curry powder, turmeric, garam masala, vinegar & sugar. Fry for a few seconds. If you need to, add a bit of water to make a paste. 2. Add the mince, stock powder, salt & pepper and mix through. 3. Add the tomatoes and cook for about 15 minutes. 4. Add the carrots, sweet potato & potatoes and simmer. If it’s too dry, add a bit of water and cook till the veggies are done – about an hour depending on how big or small the veggies were cut. The potatoes will thicken the gravy. 5. Serve with brown rice or noodles and a side salad or steamed vegetables. Steam-frying is a much healthier way of cooking as it uses less oil and prevents burning – simply add a bit of water to the pan and put the lid on until the onions are soft. If you prefer to only use potatoes, you can leave out the sweet potato and use about 6 0r 7 potatoes – or as many or few as you like. I like to add the beef stock powder because I find it really gives the curry a lovely meaty flavour, but feel free to leave it out. Why not become part of thie Healthy Eating Website! All you do is tell your foodie story or share your favourite recipe here! Your story becomes a whole page on this site and part of the healthy eating blog (which shows the site's most recent pages). So become a permanent part of Healthy-Family-Eating.com so others can read, learn and grow from your input! And I'll tweet your Web page at my Twitter account, too! Come on... join in and have some fun!